Powerful open-ended questions are the hallmark of professional coaching. The Q?Basics deck offers 54 basic open-ended questions to help coaches and managers master this fundamental skill. Although designed as a training tool it's also great for self-coaching! The questions are divided into three “suits” or categories with 18 questions in each category. For self-coaching: begin with a question or two from Simple and Curious, then explore more through the questions in the Expanding Awareness suit. When you are ready, use the Taking Action questions to clarity next steps. "I found using the Q?Basics powerful and effective in teaching coaching skills to seasoned leaders in my Leadership Enhancement Retreats. The participants stated that they found Q?Basics added great value and expedited their learning of coaching skills. They wanted Q?Basics sets for themselves." "Q-basics is useful for the newer coach seeking to learn a solid set of coaching questions or for the more experienced coach or manager wanting to get back to basics. 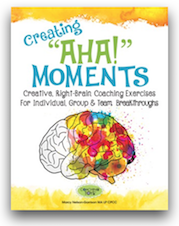 This deck has multiple uses as a training tool or as a way to keep your coaching stance when working with a client." "I used Q? Basics in a University Leadership class of 25 Executive Directors. After completing the wheel of life assessment tool and choosing an area from the assessment they wanted to work with, participants were introduced to Q? Basics. They were each given three questions, one from each category, Simple and Curious, Expanding Awareness and Taking Action. They applied the questions in that order, to their chosen area. The feedback was profound and powerful and helped participants commit to action in a very short time. I found Q? Basics to be a great way to introduce new people to coaching by helping them become more comfortable and safe with the process. I highly recommend these cards to all coaches and trainers."